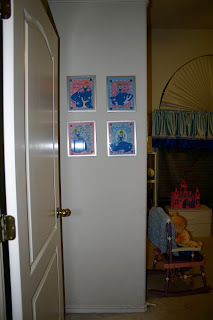 As you walk in there are four Cinderella pictures. 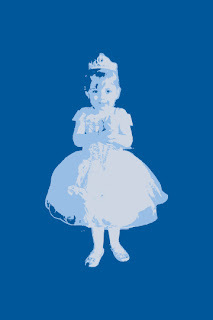 They say "Watch me dance", "Watch me twirl", "There's a princess,", "In every girl". They were part of a fabric book that you can sew together and I just cut out the pages and backed them on scrapbook paper and framed them. 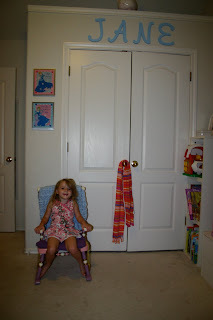 This is a pic of the closet and there's princess Jane in her princess rocking chair! My mom made these curtains to match the bedspread she made Jane for her birthday. This is the wall closest to the door. 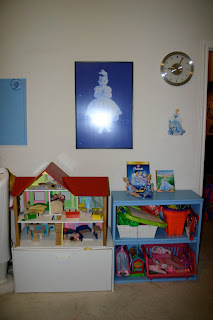 On the right is a light switch plate I made from a Cinderella art project kit. We had an old bookshelf and painted it blue (we already had blue paint from when we painted the bathroom a few years ago). Then I just put some Cinderella books Jane got from her birthday and some Cinderella dolls on top. 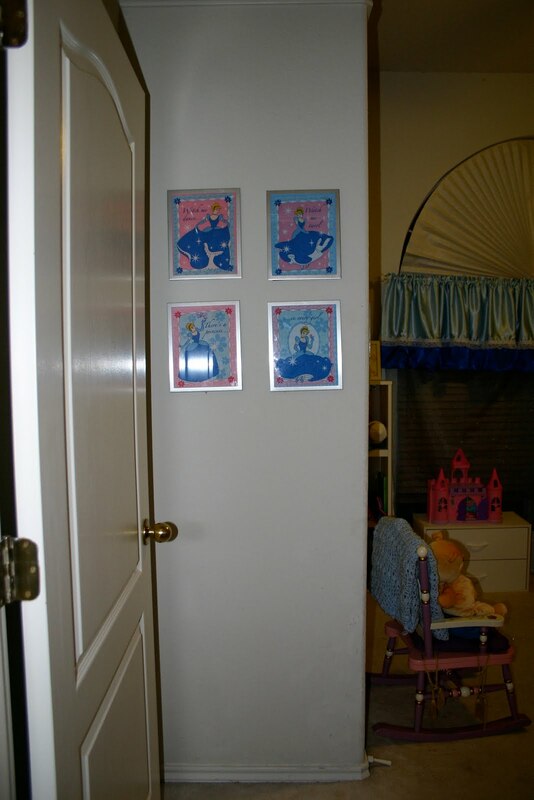 The poster is a picture of Jane in a princess outfit that Jay made in tricolor and my mom printed with her poster printer from work. Here is the picture itself in case you can't really see it. The bed we just bought from my friend Janelle. 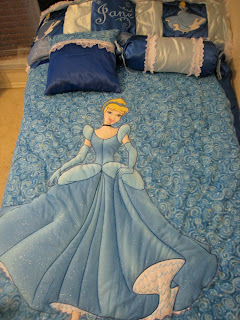 It used to be her daughter Lauren's bed. We absolutely LOVE it!! You can see there are three drawers underneath and then the headboard has shelves and though I didn't get a picture of it I guess we put a little Cinderella play set with the coach, horses, fairy godmother, mice and Cinderella on top with her piggy bank. I bought Cinderella drawer pulls for the dresser. This is on the wall behind the bed. We got that vase for our wedding and I never really have had a place to put it but I have always really loved it. I think it looks cute here with the daisies. The art work is actually art Jane made. The one on the left is a watercolor she did and the one in the middle is a tissue paper and contact paper art project she did at school a few months ago and I just framed them both. I got that blue decanter at Hobby Lobby and I think it looks like a genie bottle- but Jay disagrees. My mom made this for Jane's birthday. It's made of satin and lace and then of course she embroidered Jane's name on it.